elizabethmarxbooks: 5500 SPRING LIKE EVENT!!! I'm looking for a little love in all the wrong places...nah, just kidding, but I am giving away a paperback copy of all of my titles to one lucky winner!!! Win an autographed copy of all 5 of my titles! 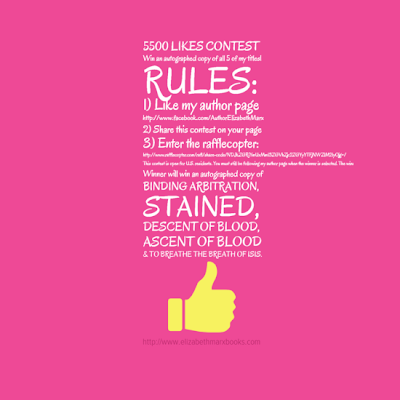 1) GO TO my AUTHOR page & give it a like! This contest is open to U.S. residents, if you're international and you'd like to enter feel free but you will get ebook copies of all the titles. I'll select one international and U.S. winner once I reach 5500 Likes on my Facebook author page. You must still be following me at the time that the winner is selected.